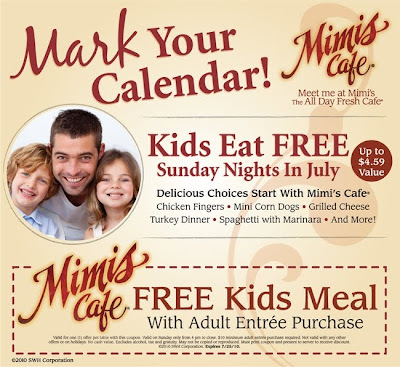 Kids can eat free all summer (with purchase of any adult entree) after 4 pm at Carrow's Family Restaurant. Get a $1.00 off a McCafe Smoothie or Frappe at McDonalds. Regular prices start at $2.29. Summer Savings with Polly Pies! Summer savings at Polly Pies. Print these coupons and save!http://tinyurl.com/258jtkh Pls RT! Thymes is giving away a FREE Kimono Rose 2oz Body Creme to all their Facebook fans thru today, July 14th ONLY! Just head on over to their Facebook page and “Like” them. A screen will pop up with the instructions asking you to comment on their Facebook wall about why you like Kimono Rose OR tell them your favorite wedding gift to give to someone. Finally email your mailing address to facebook@thymes.com! That’s it! Thanks Hip2save for the headsup http://tinyurl.com/258jtkh Pls RT! Roots is a Canadian clothing store. You may remember them dressing the US and Canada Olympic players in Salt Lake City. Their clothes are very well made and are great in colder climates. Right now if you purchase any International, World, or Canadian collection product, they'll give you a messenger bag for free. While supplies last! Click here for more information. Print this coupon for your $2.99 El Pollo Loco Grilled Chicken sandwich. Hurry this offer expires July 19th!! Discount tickets for major Florida theme parks and attractions are available at select Florida Wal-Mart stores. Phone orders are not accepted. Tickets must be purchased in person at the store. Please contact the following locations for inquiries on current prices. Get a free sample of "GoodNites" underpants for kids to use toward pottytraining. Print this coupon for a free single serving of Panda Express' Thai Cashew Chicken. No purchase necessary, and its only valid on Wednesday, July 14th. 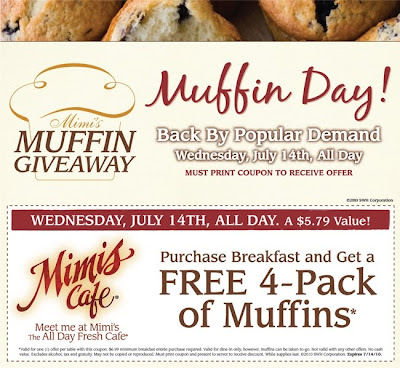 Print this coupon and bring to Mimi's Cafe on Wednesday, July 14 for a free 4-pack of muffins with any breakfast purchase! Free appetizer at Elephant Bar Happy Hour! Bring this coupon during Elephant Bar's happy hour and get a free appetizer with purchase.